I felt great going into a freestyle bullfight one time, until I saw the others there. 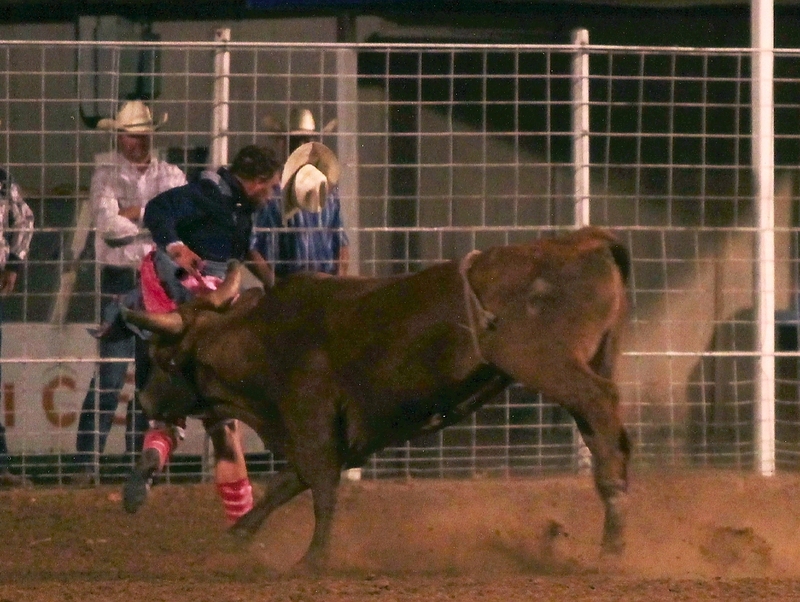 Kyle Lippencott, one of the best freestyle bullfighters I had ever seen, was in Manhattan that night as well. I should have just handed my $100 entry fee to him and saved the Rodeo Secretary the time. I was beaten before I ever tied on my cleats. But it was my own misconception that hurt me that night. I wasn’t going against Kyle, but a little cross-bred bull of Matt Williams (happy birthday today by the way). One common mistake that people make about Rodeo is that you are competing against another person. If I couldn’t beat my bull, there was no way I could beat Kyle. Subsequently I got run over a bunch and he ended up winning anyway. Still, we look at competition as me vs him, but really its me vs the animal. Sometimes faith can look like that. Belief isn’t a contest between two people. Each person’s journey with God takes on a different pace. On the Sunday morning in John 20 the first guy to the tomb was going a different pace than the second. Peter and John raced to the tomb that morning. They both got word from the women that the stone had been rolled back and the tomb was empty. In a footrace, John dominated. “The other disciple outran Peter.” (John 20.3) John was that other disciple and frankly I am impressed that he didn’t brag on that point in his book. I would have made a major point of my dominance. Anyhow, they ran to the tomb and John beat Peter. John looked in the tomb, cautiously, but Peter, in a way that is completely in his character, walked right in. He never was a bashful one. After he had taken in all the sights of the tomb, John followed him in. It is advantageous for us at this point to understand a little bit about John. He was most likely the youngest of the disciples. He was from a fishing family, until Jesus had called him to follow. He was a witness to the proceedings concerning Jesus, as he had some kind of connection to the high priest (john 18.15). He stood near the cross, seeing Jesus first hand and even spoke to Jesus’ death in his final breaths (John 19.26). He was “the disciple whom Jesus loved”. Peter’s last 48 hours were very similar in John. There seems to have been a weird “envy”, which is probably too strong of a word, between Peter and John. If you recall the Last Supper, Thursday night, Peter asks John to ask Jesus to clarify some of his remarks (John 13.22). It is out of character for Peter. He hadn’t had any problems asking questions before. Maybe he had used up all of his question tokens with Jesus earlier in the night (John 13.6ff). Even Jesus had to be getting to point where he wanted to tell him “Dude why don’t you set the next few conversations out.” Still, Peter followed Jesus into the courtyard of the High Priest during Jesus’ trial where his path and John’s differ. Peter, 3 times deny’s knowing Jesus. (John 18.15-16, 25-27) In the grand scheme of things, with all that has happened since, it seems like forever ago that Peter stood in the darkness of pre-dawn Friday and dis-associated himself with Jesus. Now with the news the women brought Sunday at dawn, the promises Jesus made coupled with the actions of Peter are brought to the forefront. At Mary’s word, a footrace ensues. Knowing John, the careful crafting of his book, and the reflective nature of his account, its is likely that the foot race in verse 4 was foreshadowing the events of verse 8. The 7 signs were meant to bee seen. The people were meant to be encountered. The speeches were meant to be heard. For John seeing is believing and how much more true it was when he reached the tomb. Over half the uses of the word “believe” [pisteuo] in the New Testament from John’s pen in this book. He has been trying to get to the end of the story from the beginning. For Peter on the other hand (as well as the women), they are the “they”. John was the first to the tomb in the race and he was the first to put together Jesus’ words and the empty tomb. Peter and the girls…not so much. Belief is easy for some of my friends. In the midst of struggle, temptation, crisis, or mockery, their faith is constant. They heard about Jesus and instantly believed and never have struggled. They are like John. Their quiet times are vibrant, their trust grows daily, and their faith is assured constantly. They are winning the foot race. My faith is more like Peter’s. Some of it is guilt that I hold onto for not being more faithful. Some of it is doubt that I can’t quite find answers for. Other times it is fear or worry that stands in the way of my belief. It may not be a pace that can win a foot race, but it will get me to the finish line. That is what Peter is dealing with. He may not have set a world record, but he did finish the race. Peter, who failed Friday morning, struggled at the empty tomb Sunday morning, 40 day’s later would wow a crowd with his faith in Acts 2. Regardless of pace, both ended up at the tomb and regardless of the splits each arrived at belief in the Risen Jesus. Whichever one you associate with, what ever pace you are running, don’t let other’s pace dictate your race. Posted on April 5, 2015 by Travis GailPosted in JesusTagged Easter, Jesus.